This is something that Koreans will prepare during festive period like Chuseok. I personally enjoy this snack alot and it is easy to make. Slice the zucchini into 5mm thick slices. Lay them on a tray with paper towel and sprinkle some salt over them. Let it dry for 10 minutes. This step is important to get rid of excess water to prevent oil splatter when frying. Then use another paper towel to dab and get rid of excess water. 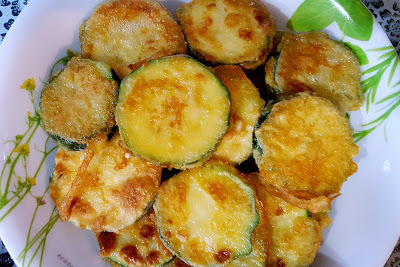 Coat the zucchini slices with thin layer of flour then coat it with egg wash.
Heat a frying pan using medium heat and add 2 tbsp of oil. Fry the zucchini until golden brown.